The bride and groom stand at the altar in front of the pond at the Manor House at Prophesy Creek, surrounded by their wedding party and friends and family. 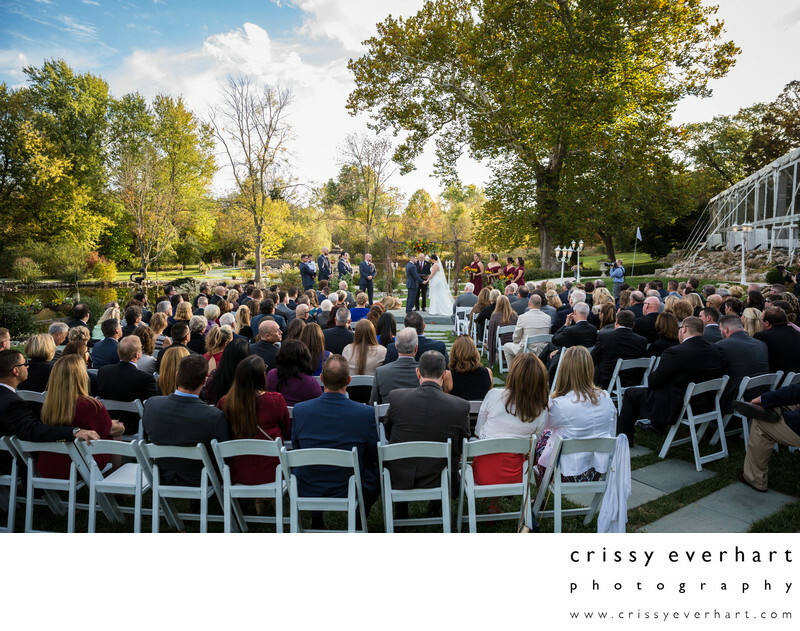 They had a perfect fall day for an outdoor ceremony, and the Manor House provided the perfect background for the wedding ceremony and portraits. Prophecy Creek Park is where the Manor House resides, and the park boasts beautiful foliage, a red barn and brick silo, a pond, and tons of open space. The reception is in a tented room of the mansion, which can be heated in the cooler months, cooled in the summer heat, and even opened up on that perfect spring day. The giant tree by the pond has a wooden swing, which is perfect for photo ops with the newlyweds.